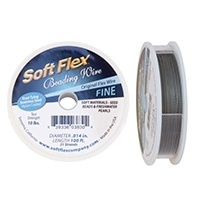 So named because they have the softest drape on the market, beading wire options by Soft Flex are free of lead and other heavy metals, resistant to both kinking and tarnish, and able to be treated as either wire or thread for stringing purposes. 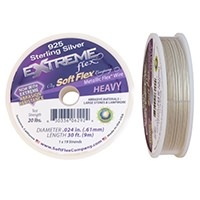 Enchanting Beads carries designer favorite Soft Flex beading wire in multiple metallic and neutral colors. 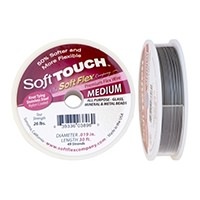 Mix and Match Quantity Pricing on Soft Flex, Soft Touch, Soft Touch Extreme and Soft Flex Metallics. Econoflex is excluded. 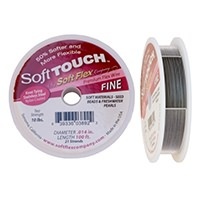 5 or more spools, 25% off. 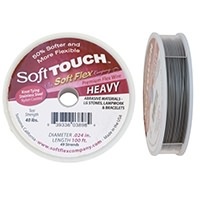 30 foot spool. 24k Gold over stainless steel. Nylon coated. 19 strands. .019" Medium. Ideal for small to medium beads in glass, metal etc. Will work with many pearls and seed beads. Test strength 15lbs. 30 foot spool. 24k Gold over stainless steel. Nylon coated. 19 strands. .024" Heavy. 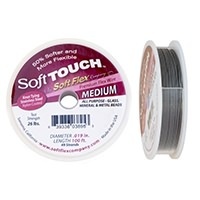 Ideal for abrasive beads or designs that have excessive use like bracelets and watches. Test strength 20lbs. 100 foot spool. Color: Satin Silver. The .014in size (21 strand) is ideal for softer, less abrasive beads such as freshwater pearls and seed beads. Knot or use 2mm x 2mm crimps. 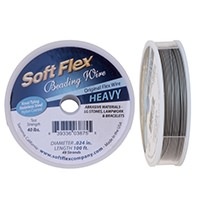 30 foot spool. Color: Satin Silver. The .014in size (21 strand) is ideal for softer, less abrasive beads such as freshwater pearls and seed beads. Knot or use 2mm x 2mm crimps. 30 foot spool. Color: Satin Silver. The .019in size(49 strand) is ideal for use with silver, lampwork, crystals, pewter, necklaces and non-abusive bracelet designs. Knot or use 2mm x 2mm or 3mm x 3mm crimps. 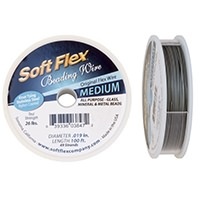 100 foot spool. Color: Satin Silver. The .024in size (49 strand) is ideal for use with abrasive materials and designs such as heavy bracelets, beaded watches, semi-precious stones and lampwork(glass). Knot or use 3mm x 3mm crimps. 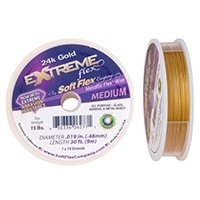 30 foot spool. Color: Satin Silver. The .024in size (49 strand) is ideal for use with abrasive materials and designs such as heavy bracelets, beaded watches, semi-precious stones and lampwork(glass). Knot or use 3mm x 3mm crimps. 30 foot spool. Sterling silver over stainless steel. Nylon coated. 19 strands. 014" Fine. Ideal for soft beads, seed beads, pearls etc. Test strength 10lbs. 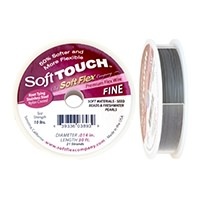 30 foot spool. Sterling silver over stainless steel. Nylon coated. 19 strands. .019" Medium. Ideal for small to medium beads in glass, metal etc. Will work with many pearls and seed beads. Test strength 15lbs. 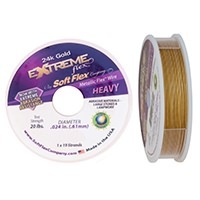 30 foot spool. Sterling silver over stainless steel. Nylon coated. 19 strands. .024" Heavy. 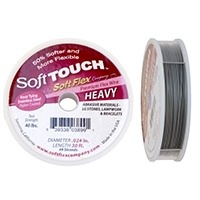 Ideal for abrasive beads or designs that have excessive use like bracelets and watches. Test strength 20lbs. 100 foot spool. .014 inch diameter. 21 strand stainless steel, nylon coated, wire. It is knottable. 10lb test. Color: Premium Satin Silver. 30 foot spool. .014" diameter. 21 strand stainless steel, nylon coated, wire. It is knottable. 10lb test.Color: Premium Satin Silver. 100 foot spool. 019" diameter. 49 strand stainless steel, nylon coated, wire. It is knottable. 26lb test. Color: Premium Satin Silver. 30 foot spool. 019" diameter. 49 strand stainless steel, nylon coated, wire. It is knottable. 26lb test. Color: Premium Satin Silver. 100 foot spool. Color: Premium Satin Silver. 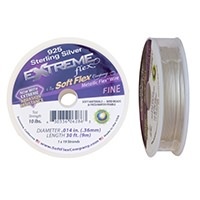 Very Fine 7 strand stainless steel, nylon coated, wire. It is knottable. 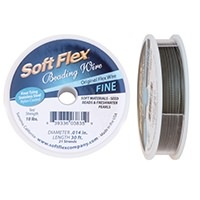 With more flexability than regular Soft Flex, it is well suited to weaving and embellishing. 30 foot spool. Color: Premium Satin Silver. 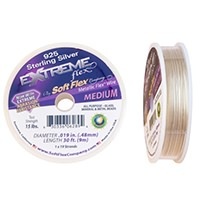 Very Fine 7 strand stainless steel, nylon coated, wire. It is knottable. 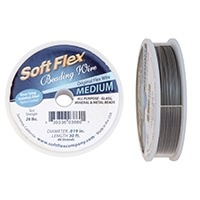 With more flexability than regular Soft Flex, it is well suited to weaving and embellishing. 100 foot spool. .024" diameter. 49 strand stainless steel, nylon coated, wire. It is knottable. 40lb test. Silver in color. 30 foot spool. .024" diameter. 49 strand stainless steel, nylon coated, wire. It is knottable. 40lb test. Silver in color.